Dun, An Caisteal: This dun occupies a conspicuous position on the summit of a rocky crag about 550m SE of Bunessan. On the N flank the ground falls away steeply, but on the S, where there is a saddle affording relatively easy access, the dun is overlooked by higher ground. 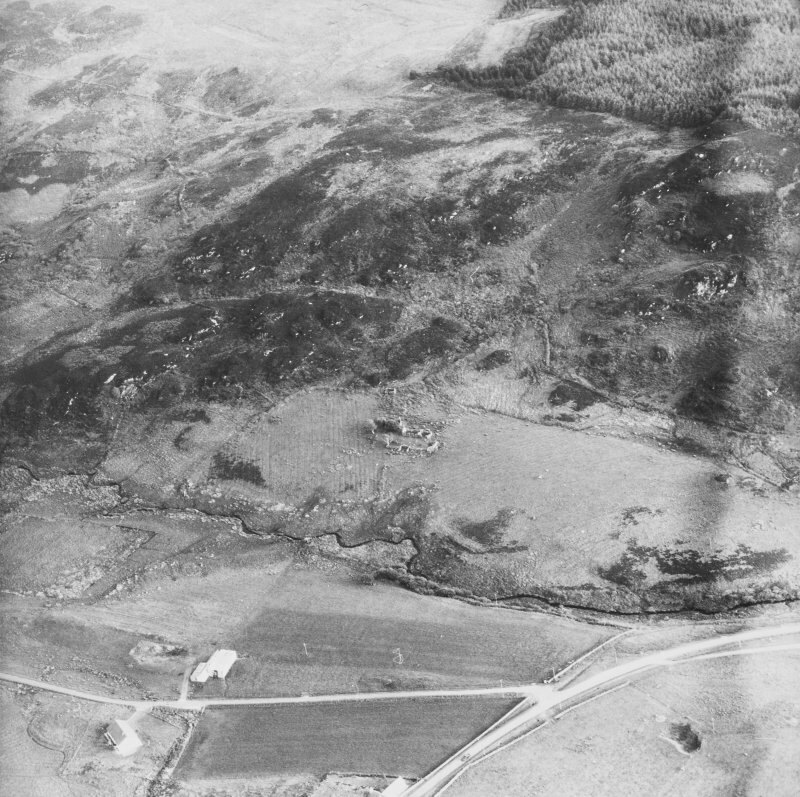 Partial excavation was carried out in 1960 by Fairhurst and the Mull Field Club during which the entrance and the SW part of the interior were examined, and a section was cut through the dun wall on the S.
The dun is irregular on plan and measures approximately 8.2m from E to W by not more than 8.8m transversely within a dry-stone wall, whose thickness was found to vary from about 4m on the S to 6.1m on each side of the entrance. No inner facing-stones were discovered in situ during the excavation, but it would be reasonable to assume that this is due to stone-robbing. as an outward-facing revetment. 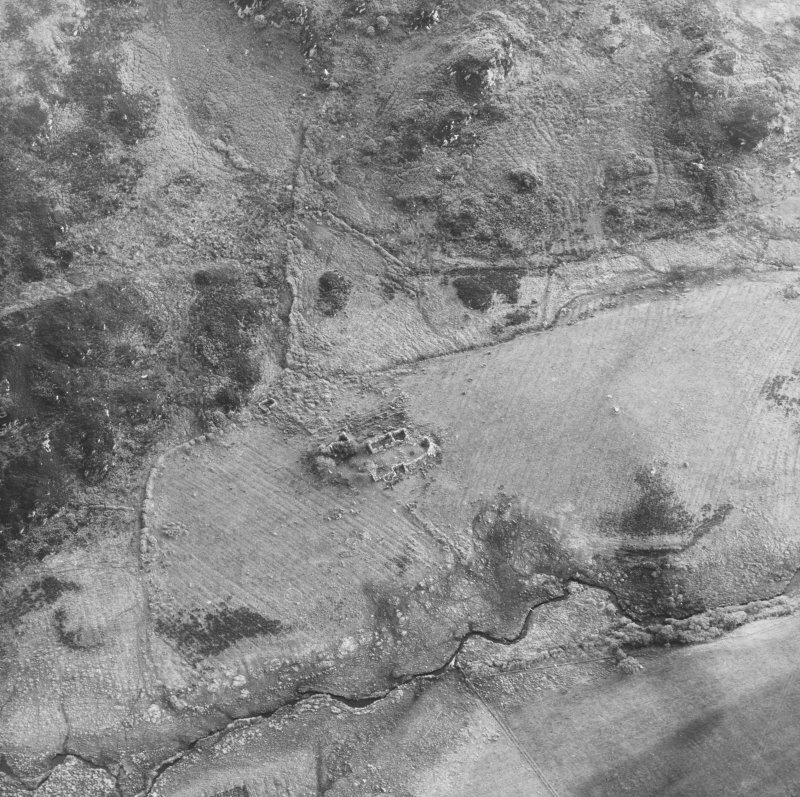 Similar features have been noted in other duns on Mull and at fortified sites elsewhere in Argyll. In this particular case, however, the revetment is exceptionally well built for an intramural feature, and it could be suggested that this is in fact the original outer face of the dun wall, to which at some later time an outer skin was added, possibly to preserve its stability. This interpretation would go some way towards explaining the unusual appearance of the entrance, which, situated on the W, measures only 0.6m in width at its inner end, but as much as 1.6m on the line of the outer face, the outermost 1.3m of the N passage-wall being stepped back bodily to make the passage roughly L-shaped on plan. The purpose of this expansion is difficult to comprehend as part of the original design, for the effect would have been to make the entrance more vulnerable to attack. However, the fact that it occurs on the line of the inner revetment makes it possible that the feature is the result of secondary alterations. During excavation an orthostatic stone slab was found blocking the entrance at the point where it increases in width, and a similar slab was discovered lying on the floor of the passage at its mouth. Fairhurst (1964) suggested that both slabs might have been used to close the passage, taking the place of the wooden door that appears to have been customary in duns. The ruinous state of the entrance, however, made it difficult to be certain, and it is possible that both slabs had been displaced from the wall of the passage; the position in which the innermost slab was discovered strongly suggests that it could originally have served as a door-jamb. Apart from three crude hearths, the portion of the interior examined contained no significant structures. The artefacts recovered during the excavation included a few small sherds of coarse native pottery, the upper stone of a rotary quern, and a small fragment of micaceous schist bearing a cup-shaped depression. H Fairhurst 1964; RCAHMS 1980, visited 1974. A dun, generally as described. Name confirmed. Visited by OS (RD) 8 June 1972. Scheduled as An Caisteal, dun, visible as upstanding remains. Information from Historic Scotland, scheduling document dated 29 October 2003.